Aurora Suite supports Microsoft Speech API version 5 (SAPI5)speech synthesizers which is the industry standard for speech synthesizers on the Windows platform. Virtually any speech synthesis product you purchase today should work with Aurora Suite. Aurora Suite includes a number of free speech synthesizers from Microsoft. Aurora Suite 2005 Professional Edition also includes support for Microsoft Speech API version 4.0a (SAPI4) for older synthesizer software such as the free L&H speech synthesizers available from Microsoft's website. These are high quality, very understandable speech synthesizers which we highly recommend for use with Aurora Suite. The languages available are: American English, British English, French, Spanish, Russian, Portugese, Korean, Japanese, Italian, German and Dutch. 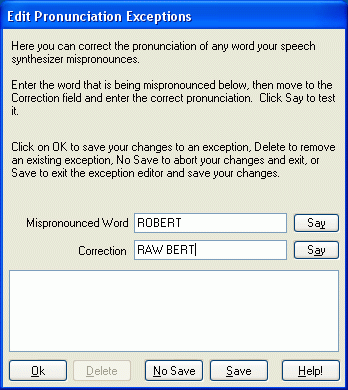 If your speech synthesizer mispronounces a word, Aurora makes it easy to correct with its pronunciation correction system. Enter the word that the synthesizer is having problems with, enter the correct pronunciation, check that the synthesizer is saying it right, and save your changes.